In its essence, the Master Chef Sausage Series is a partnership between Robbie’s Gourmet Sausage Co. and WindsorEats that will attempt to elevate the craft of sausage making while shining a spotlight on the culinary artistry of Southern Ontario’s most talented and imaginative gastronomists. The recipes for these links will come from a place of culture, personal history, daring creativity and originality. More importantly however, these collaborations are meant to highlight the epicurean talent that’s been hiding in the backs of hot, hectic kitchens where too many have sacrificed long days and so much more for the love of their craft. Each chef has worked with Robbie on a unique sausage with flavours that represent their skills and passion. Each creation will only be available a for a month inside Robbie’s Gourmet Sausage Co. shop. Simply put, Thai inspired flavours! Where do you currently ply your trade? I am the chef and co-owner of F&B Walkerville. We were named the Biz X “Best New Restaurant” for 2016, as well as voted Best Chef, Best Restaurant, Best Gourmet Food, Best New Business and Best New Restaurant for 2016 by readers of Windsor Independent. We were also voted the Best Cocktail in the Best of Windsor Essex. Who is your biggest culinary influence? I get inspired by local, seasonal vegetables and proteins. What influenced you in making the flavours of this sausage? My inspiration of this sausage is based off the flavors of a Thai meat salad, called “LARB”, that is regarded as the “unofficial” national dish of Laos. It is pork based and has tons of fresh flavor and tons of umami (fresh lime juice, mint, garlic, ginger, fish sauce, palm sugar, and fresh Thai chilies). What is your favourite spice in your pantry at home? My favourite spice in my pantry is good old sea salt and fresh cracked black pepper, being able to season any good quality protein or vegetable in season properly can really make it sing. A recipe that pairs with/uses your sausage? 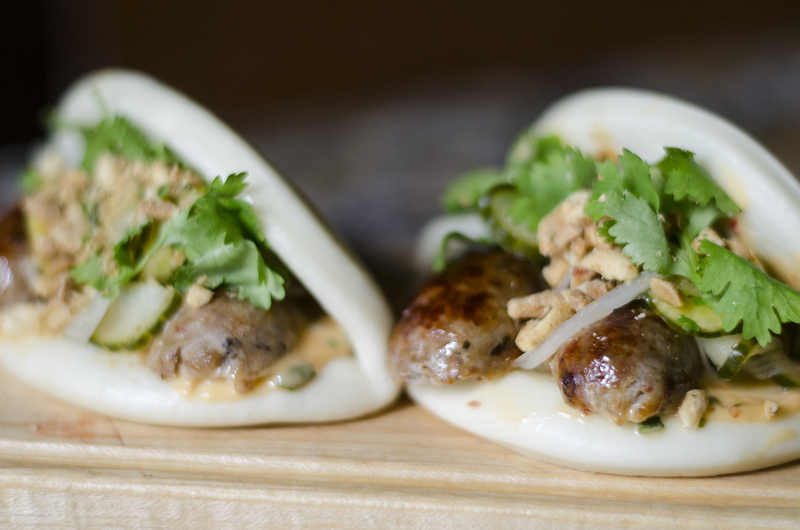 Making a steamed Bao bun with the larb sausage, cilantro chili aoli , pickled sweet shallots, and toasted peanuts. 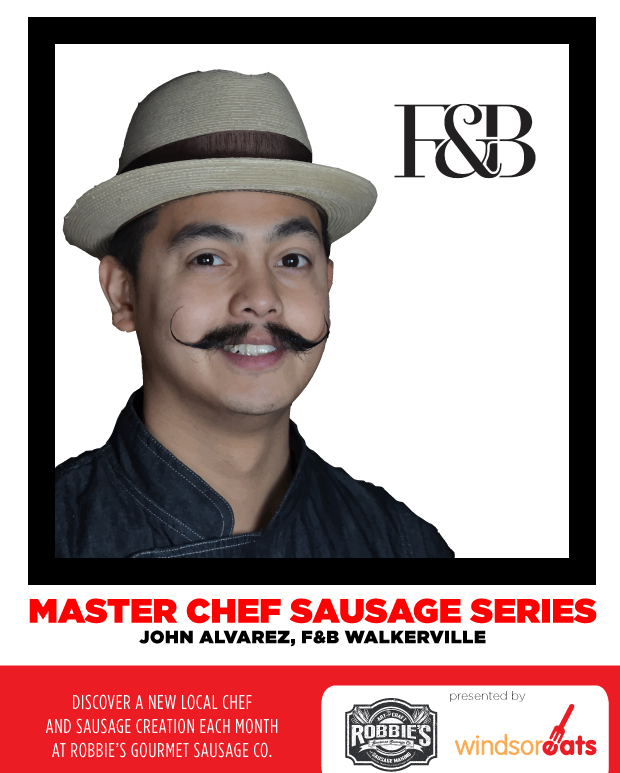 Tags: Blog	F&B Walkerville John Alvarez Master Chef Sausage Series Robbie Bornais Robbie's Gourmet Sausage Co.